Your hormones play a big role in how hungry or satisfied you feel. Here's how they work, and how you can get better control over them. Feeling peckish? You can thank ghrelin for that. 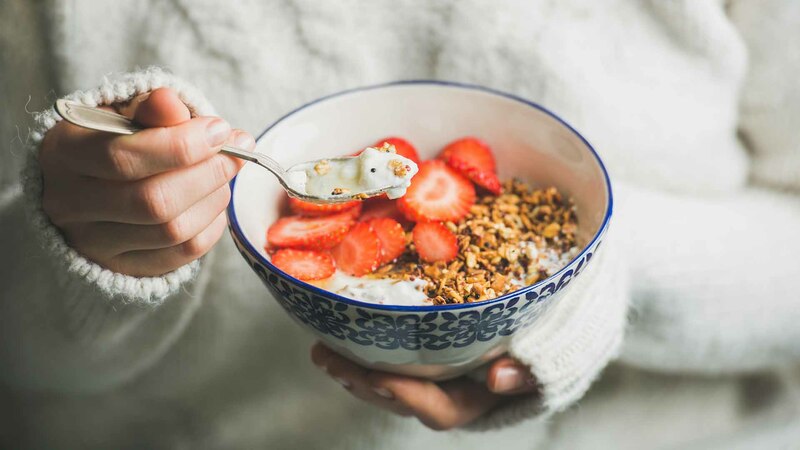 Often referred to as ‘the hunger hormone’, ghrelin is made and released from the inside of our stomach and travels in our blood up to our brain to signal that it’s time to eat. Ghrelin works on a cycle, rising before meals and dropping after meals. Tip: Listen to your hunger cues! When ghrelin is released before a meal, you feel hungry. If you don’t respond to that hunger cue by eating, the effect will continue to build, which may lead you to overeat at your next meal. Avoid the mad rush to the pantry by having small but satisfying snacks on hand to munch on the go. Think air-popped popcorn, a wholesome muesli bar or a handful of unsalted nuts – rich with filling fibre and protein to get you through to your next meal. This is the guy that signals us to feel full after a meal. Leptin is produced by our fat cells and works to turn down appetite signals in the brain. If you carry excess body weight, you may have experienced feeling ‘always hungry’ or ‘never full’. A common reason for this is that your body is experiencing what we refer to as ‘leptin resistance’. This is when the body churns loads of leptin but the brain does not respond – it’s resistant to the leptin and hunger signals keep firing. Some research suggests that inflammation in the body can contribute to leptin resistance. Therefore, consuming a diet rich in anti-inflammatory foods – such as foods rich in antioxidants (fruit and vegetables) and high in omega 3s (oily fish, nuts, eggs) – may be helpful. Ever wondered why you don’t feel peckish when you’re asleep? While we’re sleeping, leptin levels rise. You produce less leptin when you don’t get enough sleep. Not only will you be more tired the next day, you’ll also be hungrier. Time to get to bed earlier! You may have heard of insulin in relation to diabetes. The role of insulin is to transfer glucose (a type of sugar) from your bloodstream to your muscle, fat and liver cells so that it can be used by your body for energy. Insulin makes sure that your blood sugar levels don’t get too high. In cases of type 1 diabetes, the immune system mistakenly destroys its own cells in the pancreas, where insulin is made. This means blood glucose levels get very high and insulin injections or pumps may be required. In other cases, insulin resistance occurs. This means the cells don’t respond to your insulin, resulting in more insulin being produced. This can eventually lead to type 2 diabetes. It’s common to focus on your body weight, but it’s more important to think about body fat. Having more body fat and less muscle can prevent your insulin from working properly, causing your blood sugar levels to go crazy. Focus on daily exercise to help build up your muscle mass, and get enough protein in your meals and snacks to help you refuel and recover. Cortisol is often referred to as the ‘stress hormone’. It is released in response to stress and low blood pressure. A rise in cortisol levels stimulates the liver to release its stash of glucose into your bloodstream, which makes it harder for your body to control your blood glucose levels. This slows down the use of glucose from your bloodstream, which means that insulin is secreted to remove the excess. This results in a cycle of poor blood glucose control and makes it harder to maintain a healthy weight, as the excess glucose that we don’t use up can be stored as fat. A high level of stress can increase the amount of cortisol your body produces. High cortisol levels can lower your immunity, which means you’re more prone to falling sick. It’s normal for all of us to experience a little bit of stress, but if you feel overwhelmed it’s important to take some time out to rejuvenate. This hormone, sometimes abbreviated as CCK, is released into your gut and brain after you eat a meal. A little bit like leptin, CCK signals to your brain to suppress feelings of hunger. CCK also stimulates the digestion of fats and proteins in your food – including that smashed avo toast for brekkie! However, this hormone works with other hormones and has little effect on overall weight management on its own. Cholecystokinin gets released when food from the stomach hits the small intestine, usually around 20-30 minutes after eating a meal, so it’s time to slow down your eating. If you finish your meal and still feel hungry, wait 20-30 minutes before going back for seconds. Anna-Jane Debenham and Alexandra Parker are the Accredited Practising Dietitians behind nutrition consulting business The Biting Truth.